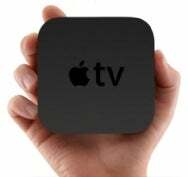 On Tuesday, Apple released a minor software update for the second-generation Apple TV. According to the release notes, Apple TV Software Update 4.2.1 addresses issues that may cause the screen to flicker or display incorrect color on some older TVs, where the Apple TV may not wake up from sleep, and where audio may not be heard on some TV models after switching from another input. The update comes less than two weeks after the major 4.2 update brought support for streaming sports content from MLB.TV and NBA League Pass, streaming audio and video from supported apps on devices running iOS 4.3, new slideshow themes, Dolby Digital 5.1 surround sound support for Netflix content, and an improved onscreen keyboard layout.